During these hot summer evenings (I can’t believe I’m actually typing this!) the last thing you want to do is slave over a hot cooker so a simple salad is the perfect solution. This greek salad is very easy but packed full of flavour. The idea of marinading the onions and using this as the dressing is from Nigella’s Ultimate Greek Salad in Forever Summer. You can change and adapt any way you please. Most recipes use less cheese than I have suggested below but I like a lot of feta in this. You can use as much or as little as you want of tomatoes, cucumbers etc.. I always de-seed the cucumbers with a spoon as I think they taste better this way. If you live with an olive-hater like I do, you can leave them out of their portion, but I do think the salad lacks something if you do this. Serve in the garden with a cold glass of white wine and lots of bread! A couple of handfuls of lettuce leaves, cos is perfect with a greek salad, here I used rocket & spinach as that’s what was in the fridge! Start by marinading the onions, they need to stand for up to 2 hours. The marinade itself will be the dressing for the salad. Make sure that they are very finely sliced and put them into a bowl. Sprinkle over the oregano, some freshly ground black pepper and a pinch of salt. Be careful with the amount of salt you use, the cheese and olives may be quite salty themselves. You can always add more afterwards if needed. Then add the vinegar and olive oil. Mix well, cover with clingfilm and leave to stand. When ready to assemble the salad, add the juice of the lemon or lime to the onions and mix well. You will notice that the onions will have softened slightly and turn pink. I like to use limes myself as I sometimes find that lemons overpower the rest of the flavours. Divide leaves between 2 plates. Add tomatoes, cucumbers and olives. Place the onions over the salad and drizzle over the marinade and lightly mix all together. Crumble the feta cheese on top and finish with some more of the black pepper and olive oil. We eat Greek salad her quite often, but I have never marinated the onions beforehand. I’m dying to give it a go and see what hubby thinks about it. He’s normally the one that does the Greek salad so if I can make a better one I might be taking my first steps towards domestic goddess status (its a long climb up that ladder though) …. I’m reblogging this recipe as it’s one of the original posts on the site and some of you may have missed it. I made a big batch of this at the weekend to go with other salads and it went down very well. 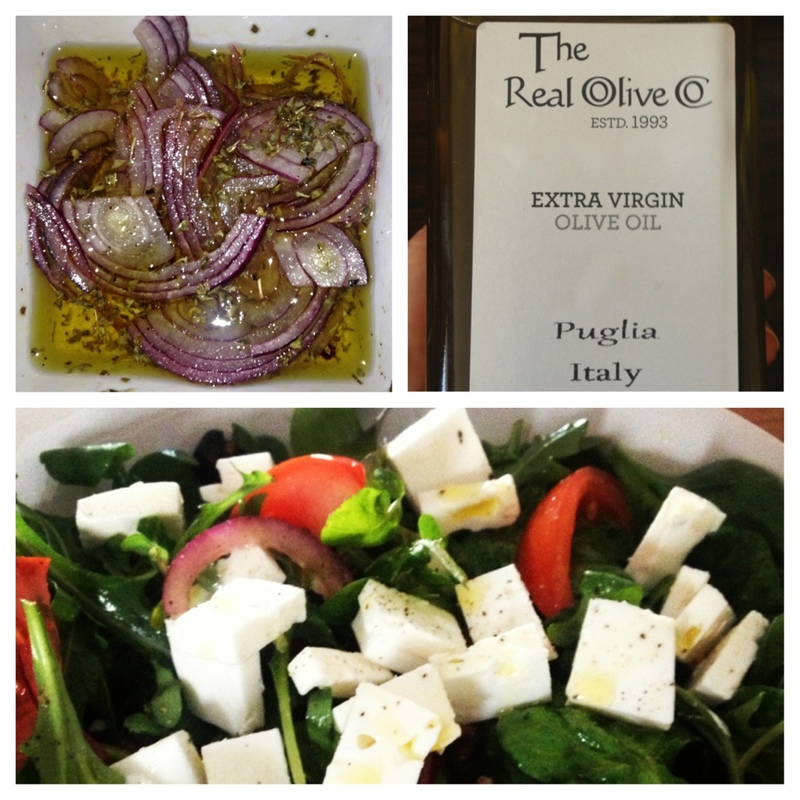 A perfect salad for the warm weather, while it lasts……. Lovely salad. I think you are a bit early on the summer evening stuff. (I understand it’s a reblog.) We are due winter again this weekend!